Now that women have joined the workforce and perform in public space, why are toilets still a public good mostly accessible to men? Toilets are where the continuity of life is located. Lacking public toilets for women in cities is clearly missing one of the most important components of being in public since; after all, they are the links that connect every other activity, urban and otherwise. In Eindhoven, there is a current lack of public toilets for women which represents a form of coercion, segregation, and discrimination from public space. In this context, the Yellow Spot establishes an alternative model of city making by starting a debate about the importance of the provision of toilets for women. The gender inequality in accessing toilets in cities is widely invisible and it is so normalized that it’s simply not questioned and mostly ignored. The inspiration behind the project happened by applying a gender perspective lens focusing on public spaces. By doing so the differences that exist between men and women accessing public toilets became visible and obvious. In Eindhoven, there are around 10 public, free urinals for men and only 1 unisex pay toilet women can use at a cost of 50 cents. Cities are also for women to live in and this also implies having places to pee. 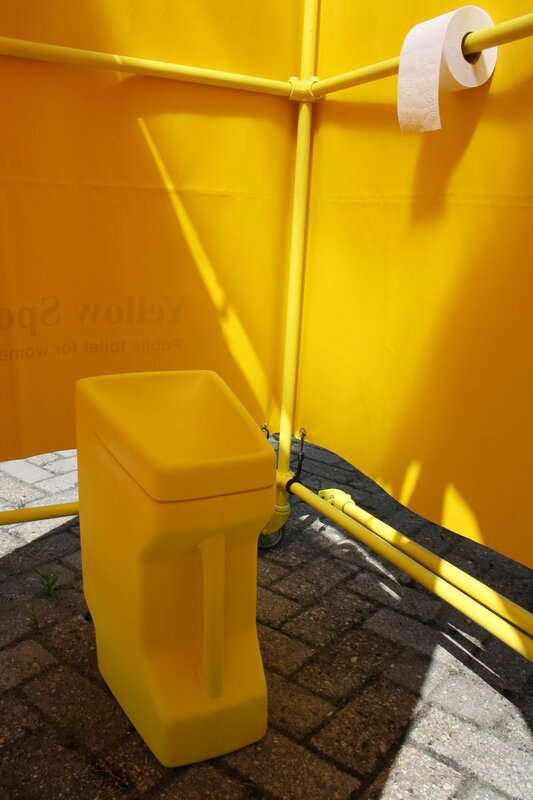 The Yellow Spot is a mobile toilet designed as a short-term solution in response to the lack of public facilities for women in the Netherlands. It works as a waterless urinal which gives it autonomy of mobility making it independent of any sewage systems. The design of the portable toilet is inspired in the jerry can and its unique design of durability and ability to contain and transport liquids. As a jerry can, the Yellow Spot’s characteristic of mobility and most importantly, its property of containing liquids, addresses an urgency, a quick assistance and alternative solution to the problem. The outcome reconciles a functional toilet and a provocative statement which, when combined, reflect the current inequality that many women still undergo in the public sphere. The Yellow Spot also allows for a coming into existence of an invisible issue. It’s explicit language of impermanence intentionally advocates for its functions to become permanent. Its temporality should not remain as such, but be replaced by an appropriate design: safe, hygienic and inclusive to all. The Yellow Spot became the physical representation of the discrimination that women undergo in public space. With situations like these, the project reveals in itself a catalyst potential to provoke conversation and visualize an issue that is pretty much invisible. This project is not only about toilets, but also about our capacity of experiencing and learning to observe cities through a gender perspective lens. Maybe this way we can begin to restructure a more equal society. To read more about the project visit the thesis here.